We took a little trip to Nankin-Mills for a little photo outing Saturday morning. With the rain we were limited to the museum (our first trip into the museum) to get what we could there. On the second floor of the mill is the head of the hydro-electric turbine. 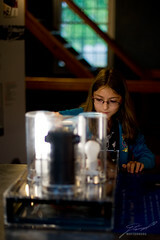 They had this little exhibit to allow human generation of power to run either a compact florescent or incandescent bulb. Very enlightening.